Customized sunglasses classic – yellow symbolizes fun and novelty. This yellow sunglass is becoming a party trend and people are largely using it for hiding their fashion faux passes and for buying attention of the crowd. This summer sunglass can be teamed with all types of attires and it is definitely get the wearer noticed in the crowd. We process huge orders of this sunglass for marketers during summers because it easily helps them to get closer to their targeted customer base. Huge discounts and special pricing is offered on bulk orders. 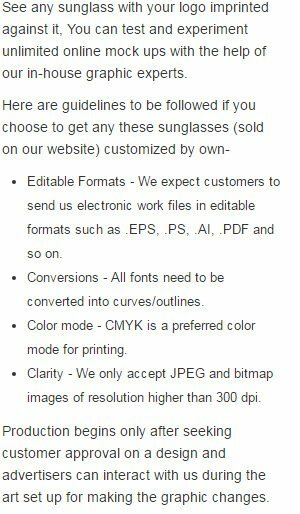 Request for a quote to know more about savings that can be availed on bulk orders of customized sunglasses classic – yellow. Features – Adult-sized sunglasses. Yellow plastic frame with tinted lenses. Offers UV400 protection.